Alicat & Sara have asked us to delve into those cookbooks and find something in celebration of Cinco de Mayo for this month's Weekend Cookbook Challenge. This has proved to be quite a testing theme and certainly highlighted the lack of Mexican cookbooks in my collection. In the end I decided on making a Mexican staple - an item that seems to be the base of many dishes - the humble tortilla. The cookbook I'm using is called "Mexican Cooking" part of the Family Circle Little Cookbook Series. The recipe calls for Maizemeal - this isn't a commonly used ingredient here, but I did find it at the organic grocer. The maize does give it that lovely golden colour. Sift the flour and maizemeal into a bowl - make a well in the centre and slowly add the warm water, stir with a flat bladed knife to combine. You want to see a stiffish dough. Turn out onto a floured surface and knead for a few minutes until the dough is smooth. 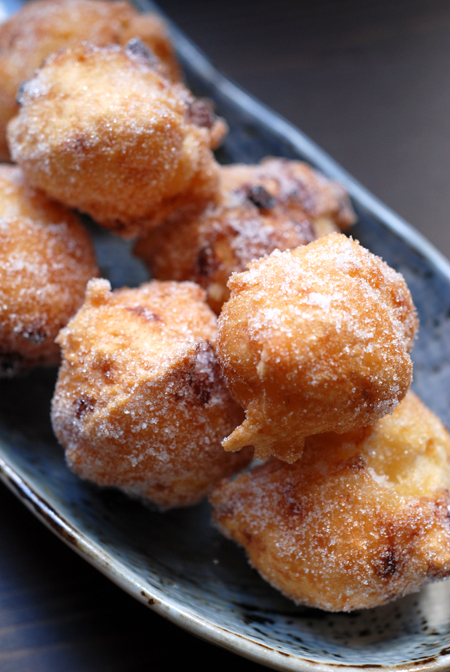 Take a portion and roll it into a ball then flatten it with the palm of your hand. Keep the board floured to stop it sticking. Begin rolling, making quarter turns to keep a roughly circular shape. Continue rolling until the dough is very thin - about paper thickness. Now, you could leave it a rougher shape or you can, using a guide, cut it to form a perfect circle. 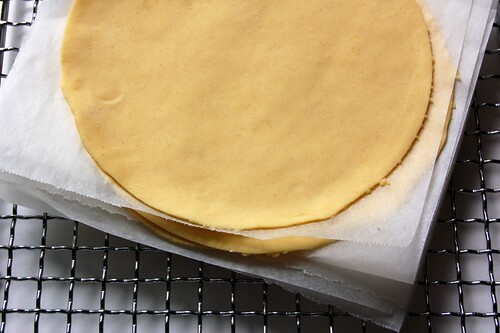 Layer each finished tortilla between sheets of baking paper - to stop them from sticking. Heat a dry flat bottomed fry pan over medium heat. Place a tortilla in the pan and when the edges begin to curl, turn it over and cook the other side. 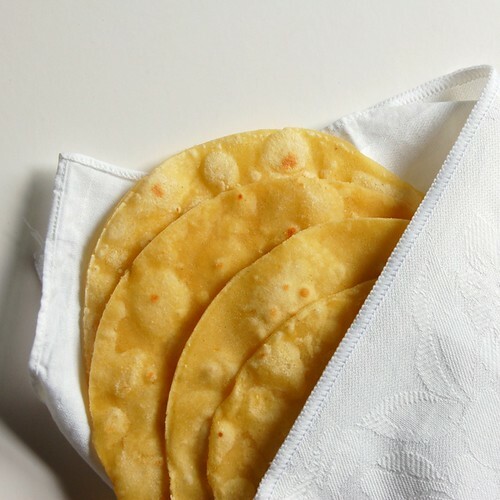 The tortillas will puff while cooking and you should notice a change in colour, from a deep yellow to a lighter yellow. Place them on a wire rack as you continue to cook the rest. Having made the tortillas I thought I should make something with them - so on turning the page in the cookbook, I came across Huevos Rancheros - a traditional breakfast or lunch dish. Heat a little olive oil in a small saucepan and add onion, garlic, chilli and capsicum - cook over a medium-low heat until softened and beginning to colour. Add the ripped basil leaves, tomatoes and a grinding of salt and pepper. Continue to simmer until tomatoes begin to break down and the sauce reduces, then add the roasted red capsicums and continue to simmer. Place a tortilla on a plate and add spread with some tomato salsa. 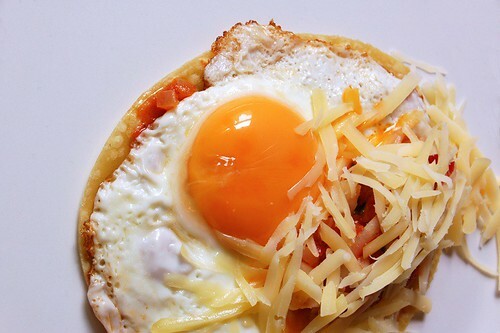 Place the fried egg on top, add a little extra salsa and sprinkle with grated cheese (I used Jarlsberg). Beautiful tortillas! They look so authentic and I bet you couldn't even get better ones in an actual Mexican restaurant. As always your photography is gorgeous! Hi Ivonne - thank you so much for those lovely comments. They were certainly something a bit different to do, you really notice the corn flavour - it'll be something to do again. it looks so beautiful and tasty. My mouth is watering now!